In this tutorial we will help you complete the task of validating importing data from Multiple Microsoft Excel Workbooks. One single task will handle importing multiple Excel Workbooks with varying filename from a single folder/directory. We will demonstrate how to configure a task to complete this goal, and you will able to quickly repeat the process time and time again. In this first example we show you how to import to a table or update a table. I another tutorial we will show you how to load and verify the data using a stored procedure. Your database administrator will be quick to tell you there are going to be problems if you plan to do this regularly. In this example we will load, modify, validate and upload from three sample workbooks. 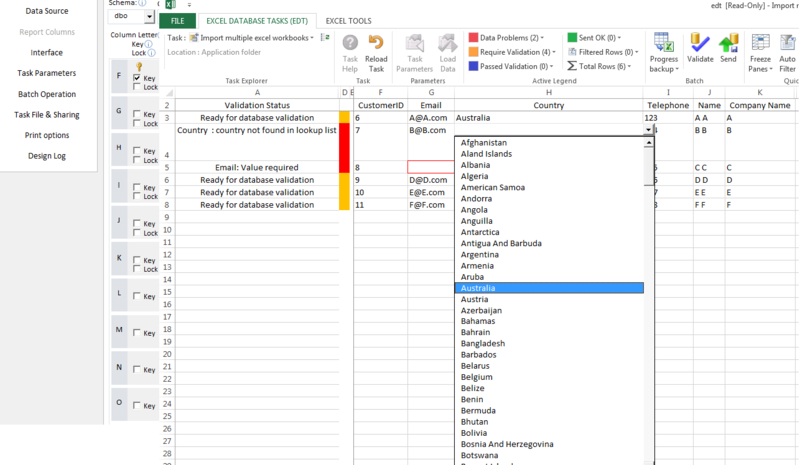 We will import from 3 different Excel Workbooks, with a similar layout. Click the New option to create a new EDT Task. Enter a task name, then click the Insert or Update table with data from any source. Note that you can also use a Stored Procedure for the destination, this can often be a more flexible solution. Notice we are using a network share for this example, SQL Server will need read access to this folder to complete this example. In this example we use the Ace/Jet driver as we this allows the Excel filename to be specified in the connections string. If no suitable driver is listed, obtain the ACE driver - see download links on the Excel Connection Strings page. As shown in the above screenshot you will now see now how easy and flexible it is to select data from the Spreadsheet Worksheets using EDT ! In our example workbooks, although the columns are in the same order, the heading have different names. Therefore the SQL we use must be generic and not specify column names. The Ace driver will then disregard the column headings. No matter what the column headers are, EDT will pull out the data without any problems. We now need to exclude the unwanted columns, this will complete in step 9 and 10. The source has a First name and Last name, but the destination only has a Name field, this we will deal with in Step 11. Note that if you wish to update existing data - please see Step 19. As you can see in the above screenshot our data contains some blank rows at the end, and also the unwanted column headers (as we have used the option HDR=NO in the connection string). These we will remove using the very useful SQL function ISNUMERIC() field to check for a value in column in the spreadsheet. The main topic of tutorial is how to allow the task user to select from a number of existing Excel files. To do this we first first create an EDT Task Parameter. We will now create a lookup that will list files matching a filename pattern, we will use an SQL server function to do this. The SQl function xp_dirtree is used to obtain the list of files in the specified folder. If a user requires access to the files, then a folder on an existing or new network share should be used. The folder must be accessible to SQL Server and SQL server must have read permissions on the directory, or the SQL function will return an empty list. We wish the selected filename to be used in the data load connection string. You see now how this solution is coming together quite nicely! Edit the connection string, removing the filename (not the whole path, just the filename). Place the cursor at the position where the filename should be. To test the connection - Click Test, select a file name from the test parameters dialogue. 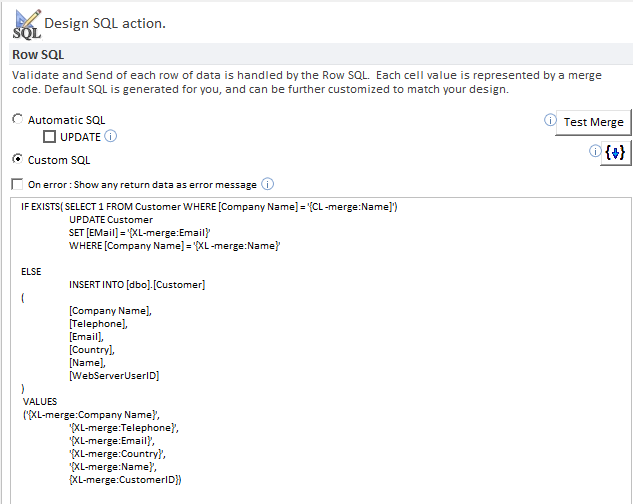 It is quite possible you may wish to UPDATE data if a matching row in the database already exists. We hope we have demonstrated that the EDT software provides a powerful and yet easy to use solution to importing Excel data - and we believe the most reliable and flexible import method. Questions? - please comment or feedback below or contact us directly for more information support@leansoftware.net.